HF: New Information in red. Desalination (or “Desalting” as it appeared to be called at that time) was a source of water in Hong Kong between 1975 and 1981. A large desalination plant was commissioned at Lok On Pai, near Tuen Mun, in 1975, but was decommissioned in 1981 because its operation was more expensive than importing water from Dongjiang in China. A Water Supplies Dept report provides considerable detail and is linked below. It was obviously written before the plant’s closure. 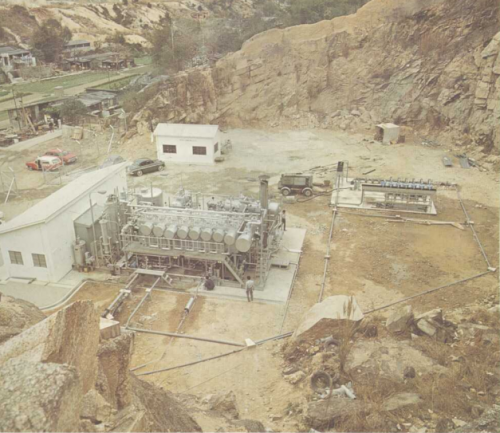 In February 1971 an experimental distillation plant was built at Lok On Pai and ran for twenty months. 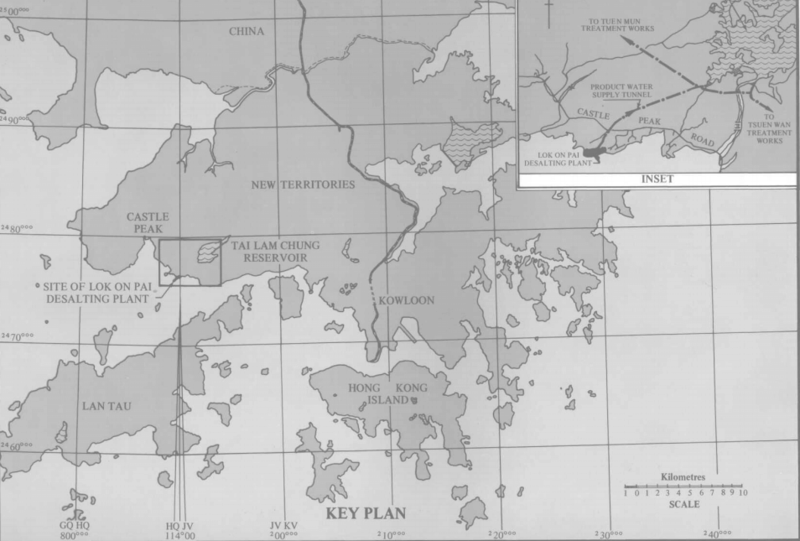 In May 1971 the HK Government officially announced that it intended to build a large scale “desalter” at Lok On Pai on a piece of land measuring about 9 hectares. The consulting engineers were Binnie & Partners (HK). IDJ has supplied this aerial photo of the plant. He adds, at the top left is the bay that is now covered by the “Gold Coast” development. IDJ further adds, When the desalting plant was being developed a number of CLP staff left the company and became government employees to manage and operate the de-salting plant. However the accelerating rises in the cost of fuel oil caused by issues in the Middle East meant that by the time it was built it was restricted in its operations. Also relations with China improved so that secure water supplies from across the border were less at risk. This was about the time President Nixon visited China and met Chairman Mao when all round relations improved between China and the West. 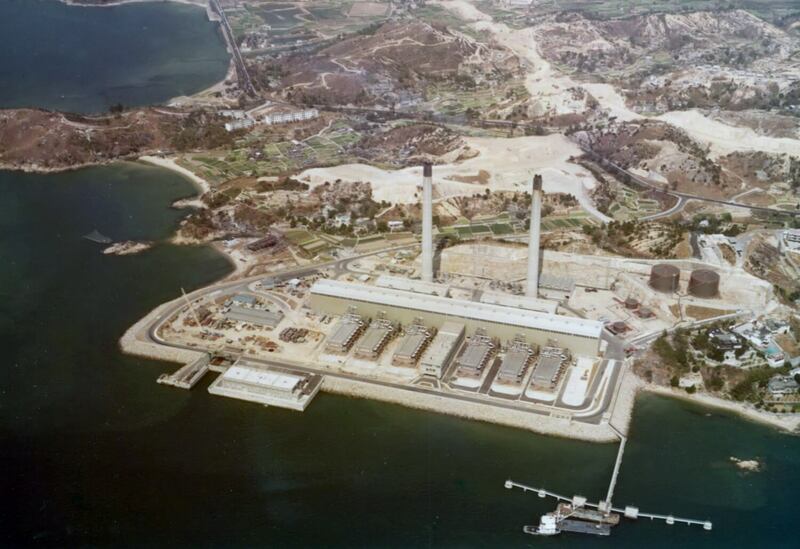 The plant was decommissioned in 1981. The Lok On Pai desalting plant was demolished in 1991. I wonder why it took ten years for this to happen? This article was first posted on 10th October 2014. Lok On Pai desalination plant Water Supplies Dept report. There is a book, Lok On Pai Desalting Plant, in English, WSD, pub PWD, 1978. The main building still exist today. Only the chimneys and the generators had been demolished/removed. The lot had been occupied as a weekend/holiday flea market for quite a few years. Don’t know what might have happened in the past year or so as I have not been there for almost a year. Last time I was there some movie makers had been filming some Police/Crime movie there with lots of people in tactical gears. Note, the market location is wront. The actual flea market sits on the right hand side of the T shape, not the left.